Situated at the heart of an area of thermal activity, the Hotel Termal is closely linked to the beneficial black thermal water. Experience the filtered variety in the hotel pool complex or the unfiltered (natural) black variety in the outdoor hotel pool. The Terme 3000 Health Centre and the Thermalium Medico-Wellness Centre offer a full range of services for your health and well-being. On top of that, you can discover the power of crystals and light therapy in the hotel pool complex. The Hotel Termal has everything you need for your well-being! This four-star hotel has 136 rooms. Situated right next to the Terme 3000 Thermal Park, it is also linked to the Terme 3000 Health Centre. It has four floors and four room types. The hotel has a restaurant and bar, while the Café Praline is located nearby. The hotel is distinguished by a themed pool complex, where guests can experience not just the benefits of thermal water, but also the energy of crystals and the calming effects of colours and coloured light. 3 hotel pools: themed indoor thermal pool complex (34-35 °C) with the path of crystals and light therapy (chromotherapy) in the rest spot, an outdoor recreational swimming pool (36-37 °C), and a black thermal mineral water pool (36-38 °C). The pools are open every day from 06:00 to 20:00 all year round. There is a bar by the outdoor pool. The Hotel Termal restaurant offers a traditional Prekmurje dinner on Wednesdays and the Café Praline, situated close to the Hotel Termal, offers daily fresh local desserts and desserts made with local ingredients. Room service is available every day from 7:00 to 23:00. Breakfast from 7:00 to 10:00, lunch from 12:00 to 14:00, dinner from 18:00 to 21:00. The Café Praline is open from 9:00 to 21:00 (September to May) and from 8:00 to 23:00 (June to August). Guests have free admission to the hotel sauna (Turkish); the Thermalium Medico-Wellness Centre in Terme 3000 offers a variety of wellness services with a Pannonian twist, baths, beauty treatments and medico-wellness services; the Terme 3000 Health Centre offers rehabilitation treatments for osteoporosis, joint and spine pain and non-infectious skin diseases, as well as a wide range of physiotherapy services. The hotel sauna is open from 7:00 to 21:00 on weekdays, from 12:00 to 20:00 on Saturdays and from 14:00 to 20:00 on Sundays. The Thermalium Medico-Wellness Centre is open from 8:00 to 19:00 (to 16:00 on Sundays) and the Terme 3000 Health Centre is open from x:00 to x:00 (Monday to Friday). Terme 3000 has an 18-hole golf course. In season, the golf course is open from 8:00 to 20:00, while the practice facilities are open from 10:00 to 19:00. Golf carts and equipment are available to rent. Organised lessons and a golf school are available. Terme 3000 – Moravske Toplice is situated in the north-easternmost part of Slovenia. Leave the Pomurje motorway at the Gančani exit, where you will see a sign for Moravske Toplice. In the village of Bogojina, turn left for Moravske Toplice. Once you have reached the town, you will see the Hotel Livada on your left. It is 185 km to Ljubljana, 285 km to Trieste, 435 km to Venice, 505 km to Munich, 125 km to Graz, 235 km to Vienna, 290 km to Budapest, 165 km to Zagreb and 535 km to Belgrade. The closest bus stop is 200 m away, while the central bus station is 5 km from the hotel. The Maribor Airport is 50 km away. Comfortable double room with a 180 cm wide bed or two separate 90 cm wide beds with a view of the park. The room (20 m2) features a bathroom with bathtub, shower and toilet as well as a desk and two-seater sofa. 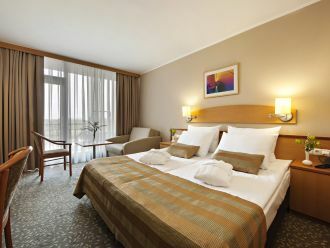 Comfortable double room with a 140 cm wide queen-sized bed and balcony with a view of the park. The room (18 m2) features a bathroom with shower and toilet as well as a desk and sofa chair. 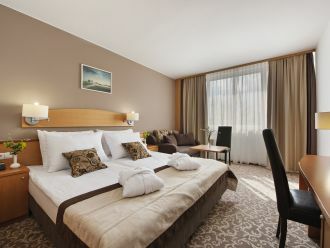 Elegant double room with a 180 cm wide bed or two separate 90 cm wide beds and balcony with a view of the park. The room (20 m2) features a bathroom with bathtub, shower and toilet as well as a desk and two-seater sofa. Terme 3000 – Moravske Toplice is one of Slovenia’s largest health resorts. There is a touch of the Prekmurje plains at the heart of every service offered here. The Hotel Termal indoor pool complex brings together the beneficial properties of thermal water, the power of stones and chromotherapy in the poolside ... relaxation room. Walk the Path of Crystals to absorb the positive energy of the singing laser quartz wand crystal for strength and vitality, hematite for protection from anything negative, amethyst for inner peace and rose quartz for loving acceptance of change. Chromotherapy with colours and coloured lights helps balance the energies of the body, thus contributing to well-being. The Terme 3000 Health Centre offers rehabilitation treatments for osteoporosis, joint and spine pain and psoriasis. The centre is connected to the Hot ...el Termal. 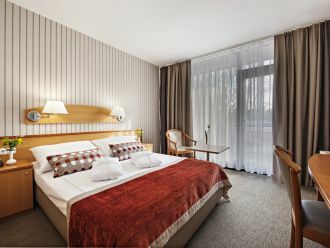 No surcharges for above-standard hotel services apply for patients sent to Terme 3000 for inpatient treatment by the Health Insurance Institute of Slovenia. The Health Centre also offers private examinations and treatments. The various physiotherapies and occupational therapies complementing the beneficial effects of the black thermal water are particularly well received. The Thermalium Medico-Wellness Centre is distinguished by its wellness services for health and well-being. Combined with physiotherapy and other servi ...ces offered by the Terme 3000 Health Centre, these medico-wellness treatments are the perfect choice for health resort guests. The Turkish sauna in the Hotel Termal is only open to hotel guests.